Crown Point, IN roofing maintenance is very important during the non-winter months of the year. A well-conditioned roof helps provide adequate circulation of air during this time. Aside from preventing your bills from skyrocketing this wintry season, however, it is best to be wary of the your roof when it comes to snow. To prevent ice dams that damage both your roof and gutter system, invest in a heating cable system. Install the cable around the perimeter of the roof or gutter to consistently provide enough heat to melt the snow. Use a snow rake to reach the roof and remove snow from ground level. Start pushing it into the snow layer by the roof’s edge. This will help in loosening up the ice on your roof and let it fall down on its own. Do this throughout the entire perimeter of the roof. Toss some calcium chloride tablets to trigger a chemical reaction and produce heat. Do this regularly to prevent deep layers from retaining on the roof. Having snow in your roof is dangerous when they build up, but it is even more dangerous if you are not careful when fixing your roof. 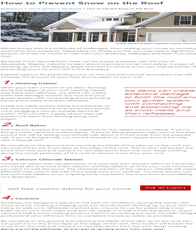 Just in case your roof is slippery or you can’t apply the snow-melting suggestions while on the ground, call reliable Munster and Hammond roofing contractors like Rogers Roofing to completely and safely do the job.